4. Scotch Greener Masking Tape for Painting - made with paper from sustainably managed forests and regenerating latex harvested from rubber trees. 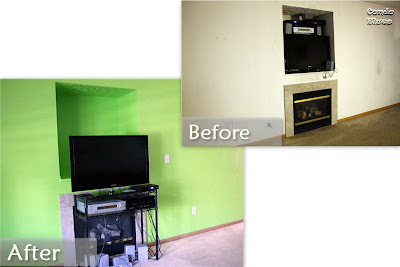 to tape the ceiling, adjoining walls, baseboards, and around the fireplace. I painted the wall with one coat of Kilz low VOC primer because my walls are damaged. The builder used watered down cheap paint to paint the drywall. I am all for being thirfy but this is why I never cheap out on paint. After the primer dried, I painted the wall with two coats of Dutch Boy Refresh no VOC paint in Hootenanny Green. I let the last coat of paint dry overnight before I removed the tape. The TV will go back into the niche a week or so after the paint cures. All of the brands of painter’s tape came up from the surfaces easily and cleanly except the Ace Hardware Painter’s Tape. The Ace Hardware Painter’s Tape ripped several times I removed it. 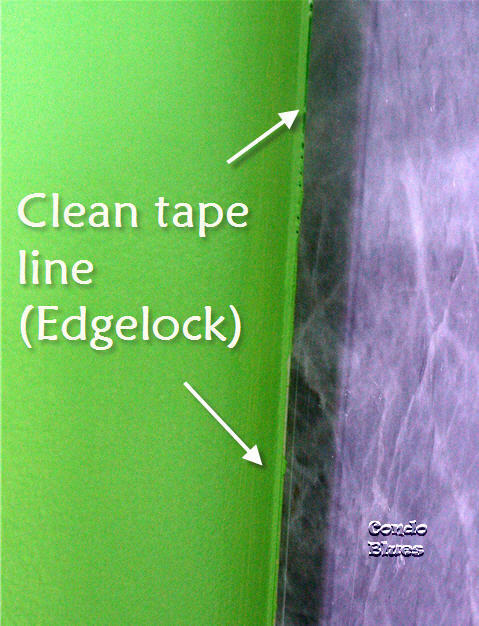 The tape lines from both masking tapes were equally clean and did not allow the paint to feather underneath the tape. Scotch Masking Tape for Production Painting did not remove cleanly from the baseboards, etc. Scotch Masking Tape for Production Painting ripped several times and I almost got a utility knife out to help me scrap and remove the shreds of tape from the baseboard, wall, and fireplace. 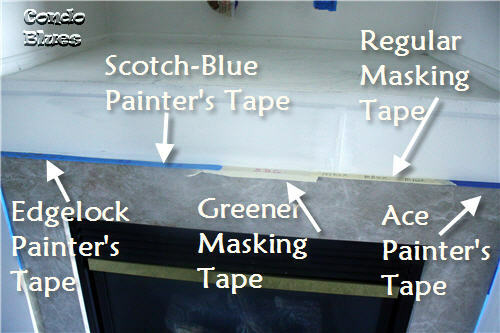 Scotch Greener Masking Tape for Painting came up cleaning and without ripping or sticking to the painted wall. Scotch Masking Tape for Production Painting removed bits of wood stain from the baseboards. 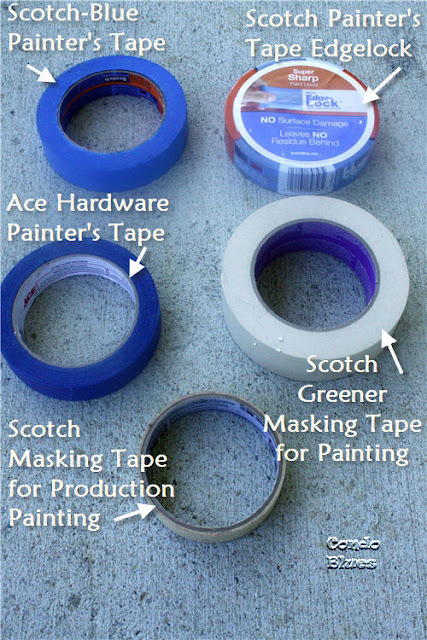 Scotch Greener Masking Tape for Painting did not disturb the paint or wood stain underneath. 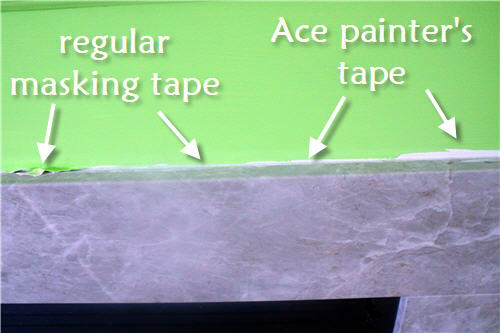 The Ace Hardware Painter’s Tape was the only tape that removed paint from the newly painted wall when I removed the tape from around the fireplace. 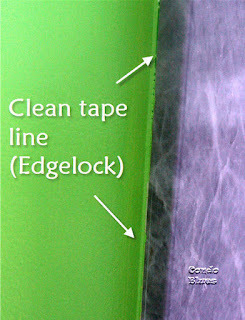 The tape with the cleanest line was Scotch Masking Tape for Production Painting and Scotch Blue Painter’s Tape with Edgelock. Both types of tape were equal in keeping the paint from feathering under the tape. Scotch Masking Tape for Production Painting stuck best to the textured ceiling than all of the tapes I tried. Most of the other painter’s tapes wouldn't stick properly and after trying and failing to get a sample of each tape to stick tightly on the textured surface, I gave up and went with the Scotch Masking Tape for Production Painting for the length of the ceiling. The paint didn’t feather under the tape which it did in other other room in the house because of the stupid texturing. Painter’s tape has a lower tack adhesive than masking tape, which makes removing painter’s tape easier, and best if you do not want to disturb the surface underneath the tape even though the masking tape was best at eliminating feathering. 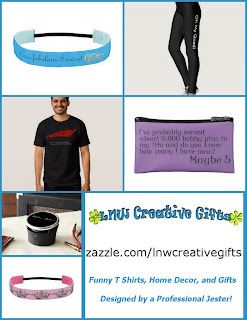 I usually go with store brands because I think they work just as well as the name brands. Not in this case because the Ace Hardware Painter’s Tape. It performed the worst out of all of the tapes because it removed paint from the wall, feathered, and didn’t remove as cleanly as the other brands of painter’s tape. I like the performance of the Scotch-Blue Painter’s Tape with Edgelock best on my baseboards because it adhered best to the curved surface. Scotch-Blue Painter’s Tape with Edgelock came up cleanly without feathering followed by the performance of the Scotch Masking Tape for Production Painting because of how well it stuck to my textured ceiling, didn't allow feathering, and didn't remove any of the texture when I removed the tape. I'm happy that the greener tape performed better than I had hoped. Naturally my two favorite performers are the two more expensive tapes I purchased. I guess I can add don't cheap out on painter's tape to my DIY Don't List. 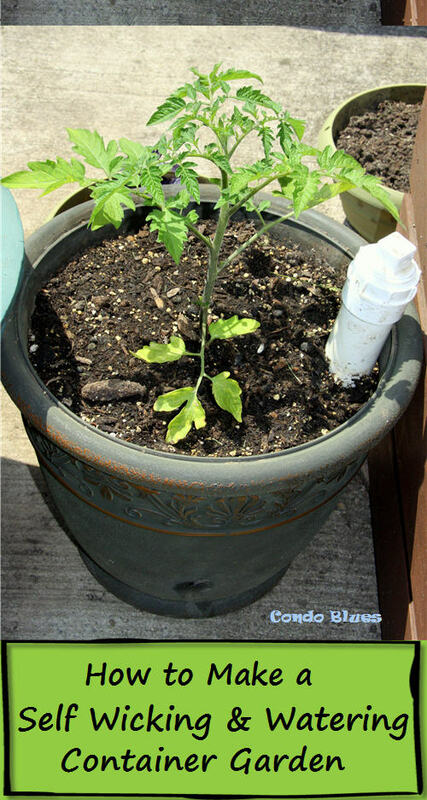 Disclosure: I bought all of the tape I tested in this post with my own money. I didn't favor one brand over the other. I just grabbed whatever brand the store sold at the time I bought it. Very good comparison, I will never buy the wrong tape again. Also that green color is stunning, great choice. Thanks for that comparison. Always wondered what was best.